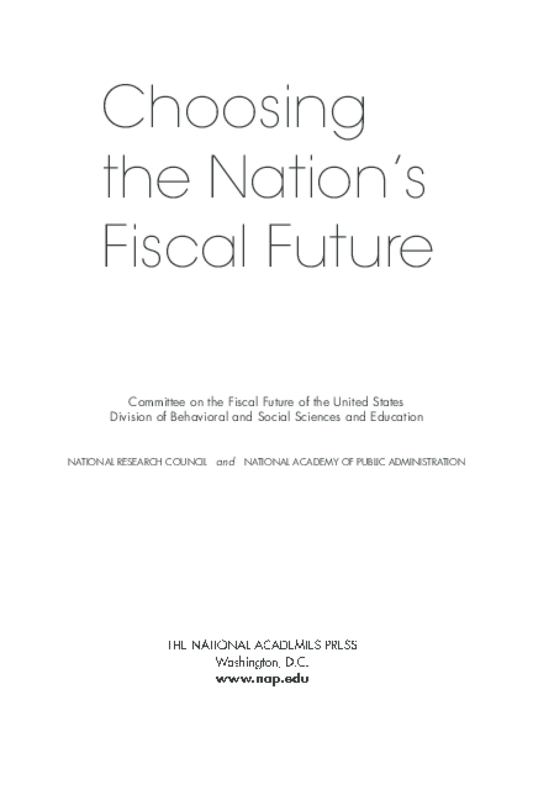 At the request and with the support of the John D. and Catherine T. MacArthur Foundation and using procedures of the National Research Council, the National Academy of Sciences (NAS) and the National Academy of Public Administration jointly undertook a two-year study of the long-term fiscal challenge facing the United States. The work was performed by a stellar committee representing diverse disciplines and practices. Together, its members possessed a wealth of experience with the federal budget and various public policies, and held a wide range of political and policy views. This report thoroughly discusses the magnitude of the long-term budget challenge facing the federal government. While other studies have called attention to this issue, this effort provides a framework that leaders and others can use to systematically consider a range of choices to put the federal budget on a sustainable course. This report represents the outcome of this shared effort between the National Academy and NAS. In their respective spheres, these two institutions play important roles in offering expert advice on some of the most significant challenges facing our nation. This report neither presumes nor recommends a particular path to a stable fiscal future. In a democracy, it is not the role of experts from outside the government to decide important policy questions, especially questions of this magnitude. It is the task of political leaders and voters to engage in the issues, elect officials who understand the challenges, and then hold them accountable for acting responsibly. Copyright 2010 by the National Academy of Sciences and the National Academy of Public Administration. All rights reserved.